Shark Defenders: Sharks and Oxygen: Fact or Fish Story? "Seventy percent of the world's oxygen comes from phytoplankton. Sharks, as an apex predator, feed on many of these plankton-eating fish. Slapped with a stigma as people-killers from the popular "Jaws" series, sharks actually save lives — they help provide the world's oxygen supply." Let's put this one to rest -- forever. The answer is no. There are no scientific studies that link shark populations to the global supply of oxygen. If we are mistaken, and there is a study, please forward it. Now we are just as guilty as others in promulgating this shark-oxygen relation (here and here), and for that we apologize. Mea culpa. In our list of 10 Things You Can Do To Protect Sharks we list #1 as Educate yourself about the global situation of sharks. On this oxygen issue, we recommend starting your education with Rick Macpherson's recent blog at Deep Sea News and Patric Douglas' blog at Sharkdiver.com. This is not, however, a repudiation of the fact that sharks maintain overall ocean health. 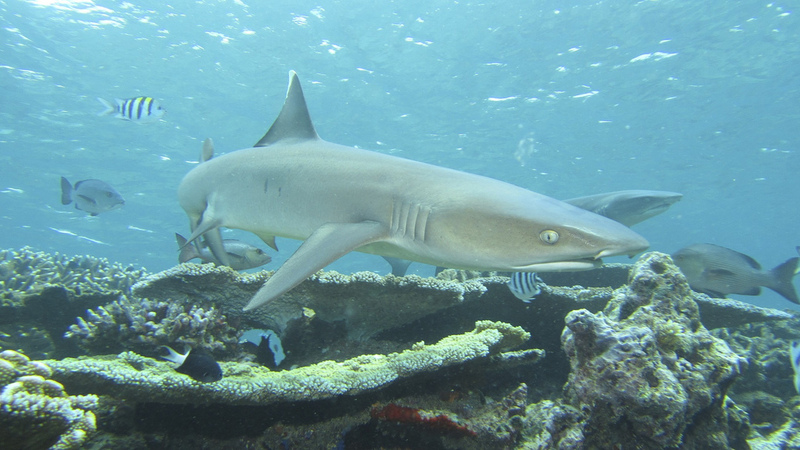 There are many, many studies that link sharks to coral reefs. 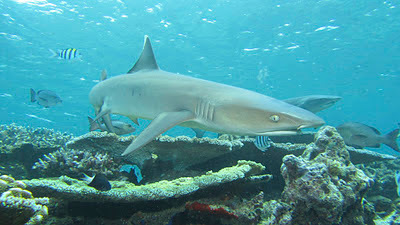 Also, the removal of large sharks can negatively impact whole ecosystems by, for example, allowing an increase in the abundance of their prey (fewer sharks eat less prey), or influencing prey species through non-lethal means, by causing behavioral changes to prey habitat use, activity level and diet. A science report by the Pew Environment Group titled Sharks:State of the Science is an excellent resource for referencing many of these studies. In university right now, ecology professors are teaching this very idea. You need to understand that much of science deals in theories... I am sure you have heard of "Newtons Theory of Gravitation?" Basically theorizing that gravity exists; it's still just a theory...and "The Theory of Relativity?" Many of these ideas are based on hypothesis as opposed to using empirical discovery, however they are all considered acceptable and people agree that they are as close to the truth as we will ever get. While I am unaware of one particular study that tests the marine food web collapse theory in terms of proving that the loss of phytoplankton would significantly reduce the world's oxygen (it would make for a great thesis or dissertation for those of us continuing our education in the science field), in theory, it would make sense that if sharks were to disappear, forage fish would proliferate. If there is an overabundance of plankton feeders, the phytoplankton could disappear and the question is, how would it affect the Earth's oxygen supply? The other question is would the marine food web evolve to make up for the disturbance? It could go either way. Notice I use words like "can" and "could." While we can't say, that something is for sure without proving it, on the other hand, we also cannot say that it is emphatically incorrect, again, without testing it. So, just as there may not be a study to prove the theory correct, there also isn't one to prove it wrong. So, to answer your question, it cannot be answered by a simple yes or no, but we can theorize what will happen one way or another. We haven't been able to pinpoint the earliest mention of the sharks-oxygen link, but here is a story from 2004 in National Geographic that links sharks to oxygen, not the other way. The myth may have started with Erich Ritter, who was in Sharkwater, and has posted on his website: "The protection of sharks is crucial for the balance of the oceans, earth’s main producer of oxygen." It was Rob Stewart who spent far too much time in the media fog of Sea Shepherd's Paul Watson a man known, even praised, for his magical ability to pull made up and factually incorrect quotes out of his hindquarters at will. I am sure Rob and Paul never imagined the public would adopt this strange narrative as readily as they did without any question of it's validity. Again, in Universities all around the world, including the U.S., it is being taught that 70% of Earth's oxygen is derived from cyanobacteria (phytoplankton) in the ocean. Will disrupting the marine food web cause an issue for us in terms of obtaining oxygen? Until a model is formed and tested, there is no answer to that question. So, we are left to theorize and unfortunately, the information that is available shows that there likely would be some negative side effect (small or large scale) regarding our oxygen supply. Thanks for the anonymous comment, Jessica. The oxygen link to sharks is a myth. The study you cite does not even mention sharks. I encourage you to do a little more research on this, and contact some experts if you must. You'll find you are mistaken. As I state in the post, this does not mean that climate change has been debunked or that sharks do not maintain overall ocean health. The cascading affects of losing apex predators are real, but the production of oxygen is not linked whatsoever. Why is it that nobody who comments in favour of this crazy myth ever wants to put their name to it? Simply using the right lingo and sounding the part does not make an expert, just ask the cranks who started spreading this nonsense. If you're so confident with your arguments, put some ownership on it and debate in public, an unwillingness to do so shows, in my opinion, lack of confidence in what you are saying. Not one single person with any credibility has backed the Sharks/Oxygen theory. Not a single one. "I think educating people is so important. As you have seen, misinformation spreads quickly and it's not going to help our oceans..."